Pretty much every local SEO out there claims to be a Google Business Expert, but who are the real Google My Business Experts?. Officially ( from Google ) there are currently nine Google My Business Experts, or Top Contributors around the world. Google Top Contributors have extensive knowledge about Google products, they get exclusive invites to try Google products earlier than the general public and have direct access to Googlers, in case of product issues. View the Google Top Contributor website. I asked the Google My Business Top Contributors a couple of questions. How, why did you get involved in the Google My Business product? 10 years ago I used to work for a company that sold PPC. I remember working with tons of small businesses and these little ABC pins started showing up in the search results and all my clients were obsessed with how to get listed there. I made it my #1 goal to figure it out. Back then it was extremely easy to rank and I remember feeling thrilled when I was able to get them ranked overnight. If only it stayed that easy. Google labels their Top Contributors as “people with expert product knowledge”. How did you build up your “expert product knowledge”? When I first started learning SEO, I bought a bunch of books and read through them and took excessive notes. Next, I followed some of the major leaders in the industry (Mike Blumenthal, Search Engine Land, Moz etc) and started posting questions on the GMB forum. I quickly realized how great the Top Contributors were and learned a ton from Mike Blumenthal and Linda Buquet. At that point I knew I had to invest a lot of time into answering and helping business owners to earn and maintain the Top Contributor status. It’s been well worth it. What motivates you to help businesses in Google My Business product forum? I love the satisfaction of helping other users who are struggling to understand a product that I have a lot of knowledge about. There is something weirdly gratifying about having some user mark your post as Best Answer. 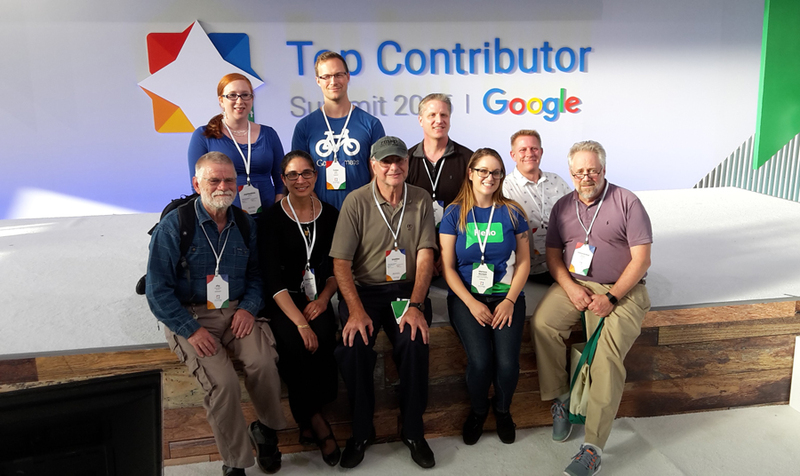 What does being Google Top Contributor mean to you, personally and professionally? I often see being a part of the TC program as a badge of honor. I love that Google is willing to offer this program to volunteers and think it’s a really unique program that is a win-win for everyone. I think more technology companies should offer them. I also think that as a part of the TC program it’s my job to help educate people about Google’s guidelines and how to remain within them. What functionality would you like to see introduced into Google My Business? I would love more call-tracking abilities because one of the hardest things with Local SEO is showing ROI. I would also love it to integrate with Search Console and Google Analytics. I really miss seeing the search queries but I don’t foresee that as a feature Google will ever bring back. I would also love to see some type of Twitter-ish feature that allows a business to post an update that shows in the search results. Something like the tag feature they used to have. Joy Hawkins has been working in the Local SEO industry since 2006 and loves being a Google Top Contributor. She also loves spending time managing Google AdWords accounts and has been certified in both Google Search & Display. She is also a speaker at SMX – the world’s largest search engine marketing conference. I got involved in Google My business because I was involved in Google Plus (2013) and I was involved in Google Plus because I was involved in Google Plus Local (2011) and I was involved in Google Plus Local because I had been involved in Google Places (2009) and I was involved in Google Places because I had been involved in the Google Local Business Center and Google Maps (2006). Hmm… its not that I am confused but I do think Google is. I started playing with and exploring Google’s value to local businesses and SEOs in 2003. At the time, and still, I had more questions than answers. As I answered one question for myself, two more would pop up. I started writing about these questions in fall of 2006 at my blog. So if I had to answer your question I would say that I did so by asking questions. As I was exploring Google’s products I stopped by the then Google Maps forum and realized that other businesses were flailing. At the time the Google product had a “few flaws” and fixing them was rocket science. I really felt sorry for the many small businesses in the forums that were being caused pain by the buggy product and total lack of google help so it felt good to spend some time helping others. This is a hard question to answer as I am so ambivelant about the program. Google is one of the richest companies on the planet, they have had 9 years to get the product right and yet they are still relying on volunteers to provide a whole level of support. So on one level it means that I am working for Google for free. On another level it allows me to keep asking questions about how it works and interact with others in the program that have the same level of curiousity that I do. So I get to keep on learning. I would rather like to see a different process rather than a product. Google has built so many things for Local and thrown so many away. Thus for small businesses it’s been hard for them to understand what was happening and how Google could help them. I would just like to see a process of regular steady feature developemnt that would allow small businesses to slowly and steadily learn and grow in their ability to leverage Google for their on line marketing. Instead what we have are a series of product features that change before anyone can learn them. Mike has been involved with offering web services since 1995. Prior to specializing in web design and search consulting in 2001, Mike was a principal in a family owned and operated retail business for more than 30 years. Like all small business owners attempting to market to a fragmented clientele, he was continually frustrated by the barriers & costs imposed by the advertising options available. Shortly after Google Maps was released in 2004, he threw out his nine Yellow Page books and started focusing on Local Search. During the week, you can find him at his blog, Understanding Google Maps and Local Search, where he writes about local search and its impact on the business community. During the past year Mike, co-founded two locally focused companies: LocalU.org, which focuses on small business education, and GetFiveStars.com to help small businesses deal with the complexities of customer feedback and reviews. I got involved through helping my family with their local listings and then branching out to other clients. Trial and error in a lot of cases! Reading forums and blogs helped as well. Realising that not everything in GMB was available in Australia (or at least not at the same time as the U.S. / Canada) made me have to think more deeply about the product and what might / might not work in Australia. Reading the GMB forum you can see how frustrated, upset and passionate business users are about the way GMB affects their business. When I know the answer, or can help them in some way to find the answer themselves, then I feel I should do so. It sounds corny but to not help would just be plain rude in my opinion. I love the network of people I have been included in – not just GMB TCs but the broader Google TC community. They’re a passionate bunch of people with an amazing diversity of knowledge, skills, experiences and I love hanging out with them (albeit online). I’ve also learnt a lot from my fellow GMB TCs – both about the product and also about the business of Local SEO. It’s nice to know there’s a group of people out there who care as much about GMB as I do, and don’t think I’m sad for thinking about it as much as I do! For business owners, the opportunity to highlight reviews that they’re particularly proud of receiving – so that they could perhaps be featured as snippets, or at the top of the review list. In my opinion this would reduce the angst about negative reviews since you could potentially push them down the list by highlighting more positive reviews. For people helping business owners, I’d love to get a more helpful suspension notice – it doesn’t have to describe exactly what’s happened, but even something like “We’ve noticed that your business is in an industry that commonly visits customers at their location – is this the case for you?” could drive people to a more appropriate resolution. Priya Chandra has been working with the Internet and the World Wide Web in some form or another since 1992. After many years working for other people (in both private industry and the public sector) in social media, online communications and HR she got involved in local SEO in late 2013 and has been addicted to Local search ever since. She loves being a Google Top Contributor and if she’s not helping out there, you’ll find her on the Local Search Forum where she is also a Top Contributor and at Priya Chandra Consulting. You can connect with Priya at Google+. I became involved with GMB (at the time it was Google Places) in 2010. I had just finished University, where I studied Tourism Planning and Management. I was all ready to look for a career in my field of study, when I was hired to do sales at a marketing agency in Toronto. To make a long story short, the sales thing didn’t work out, and I transferred to the marketing side of the company and began my Local SEO adventure. Shortly into this, I was introduced to Google Places by Joy Hawkins, a fellow GMB Top Contributor. I was fortunate enough to have a ton of hands-on experience with Google Places early on when I was just getting started in the industry. I logged into 100 to 200 accounts each and every week. My full-time job was to perform “maintenance checks” all day long, where I would go through a checklist of optimization items and troubleshoot complicated Places issues. This is back when Google Places was rampant with bugs, duplicate listings, merged listings, and all sorts of problems. Naturally, this allowed me to see and experience more than the average bear when it came to Google Places. Over the next year or so, I developed a sixth sense for all things Google Places/GMB. At the same time, I developed a strong sense that this whole Local SEO thing was what I wanted to do for a living and I could see a future in it. So it became a passion as well as a job. I also can’t give enough credit to Linda Buquet. Linda was an inspiration and a mentor very early on in my career. Once Linda developed the Local Search Forum, it became my home away from home and allowed me to take my Google My Business knowledge to the next level. My answer is a selfish one. Simply put, it makes me feel great when I can help someone with a problem or simply make sense of something that is kind of confusing. That’s the main motivation for me. A very close second reason, is the constant quest for more knowledge and expertise. And the more time you spend helping out businesses on the forum, the more knowledgeable you become. On a personal level, it means that I can tell my friends and Family that I work with Google in a certain capacity, and they think I am one cool dude (Except for my Wife. She just thinks I’m a big geek). I would love to see some better functionality around how to properly report a listing as moved. Currently, the only way to do this is by contacting GMB support. There is an option to do this in Google Maps, but it’s currently not functional. Colan Nielsen is the Agency Operations Manager at Powered By Search. Colan has a passion for all things related to digital marketing, and for Local SEO in particular. When Colan isn’t helping business owners at the Google and your Business Forum you can find him at the The Local Search Forum where he is also a Top Contributor. You can connect with Colan on Google+ and follow him on Twitter. I have always been involved with Google’s business product in its various guises over the years. When Google+ was launched and places integrated and morphed into Google My Business, the future looked bright for businesses and I immersed myself. In 2000 I bought my first restaurant in Kendal, Cumbria, in 2001 the Foot and Mouth crisis hit Britain and local tourism hard. The British press effectively labeled Cumbria a no-go zone and something had to be done to let people know that businesses were still open. At this point I was also opening up my first hotel in Grange-over-Sands and I started creating PDF maps and printed maps of local businesses that were open for business. I started using my hotels website to market the area and local businesses, this was 4 yrs before Google Maps was launched. I decided to move into the online space permanently in 2004 and sold up moving to the Midlands. My motivation stems from the sheer overwhelming fear and helplessness that I felt as a business owner during the foot and mouth crisis, each time I help a business, its one less thing for them to worry about. Pride, I really feel proud that Google has recognized me for the time we spend helping businesses and improving the product. Being immersed in the Google product, I see problems and situations that the average webmaster or SEO will never see, and this certainly gives me and my clients an edge. My main frustration with the product at the moment is the reliance of third party data over the actual businesses data. Managing reviews certainly needs looking at by Google, it leaves a bitter taste in businesses mouths when they cannot get a malicious review removed.